Billions upon billions of animals are used every year for the purposes of scientific experimentation. It’s actually hard to think of another practice that’s as commonplace as it is controversial (biotechnology, perhaps?). It goes without saying that many of these experiments are a waste of time and resources. The NIH, for example, recently spent about $4 million exploring how the menstrual cycles of monkeys were influenced by cocaine, meth, and heroin. Other animal-based experiments, however, appear to have genuine utilitarian value, contributing useful information to our knowledge of Parkinson’s, Alzheimer’s, and several cancers. Delve into this issue and you’ll find that only one thing is certain: clear answers aren’t forthcoming. I generally believe that animal experimentation is a morally flawed way to accumulate scientific knowledge. That said, I plead agnosticism when it comes to rare cases of direct benefit to human life. I’m sure that if one of my children were afflicted with a life threatening disease and experimentation on monkeys had a plausible chance of finding a cure, I’d reluctantly support that research. As much as I’d like to be consistent on this issue–as I’m able to be with, say, my diet–I’m afraid I must take convenient refuge in Emerson’s saying about foolish consistency and little minds. As I said, nothing about the morality of animal experimentation is easy. Perhaps one way to come to terms with this conundrum is to consider animal experimentation in more abstract terms, rather than on a case-by-case basis (with many of those “cases” being purely hypothetical). As I see it, one point in particular transcends specific examples of animal experimentation to suggest that we should be doing everything possible to eliminate the practice altogether–except perhaps in the most extreme cases of direct human benefit. The point has to do with the fact that, as scientists use animals to further scientific knowledge, they do so without a full, or even half-full, understanding of the animals they’re exploiting. Animal experimentation has been happening for hundreds of years, but the field of animal ethology–the study of animal behavior and mentality–is relatively new. Because the cart of experimentation has been put before the horse of knowledge, scientists routinely end up not only inadvertently harming animals, but unknowingly executing flawed experiments bound to yield inconsistent, and thus ultimately useless, results. Animals, unlike objects, have emotions. 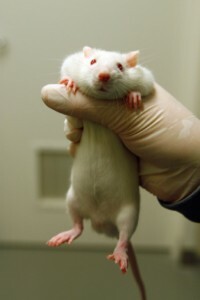 Mice, rats, birds, or apes kept under one set of conditions will react differently to the same experimental stimuli than will mice, rats, birds, or apes kept under another set of conditions. Only now, however, are we coming to realize how incredibly sensitive experimental animals are to differential experimental environments, handlers, and procedures. The implications of this sensitivity have radical implications for every experiment done on an animal. A couple of real life examples, both taken from Bernard Rollin’s insightful book Animal Rights and Human Morality, highlight the problem. The first involves mice and the experience of shock. In order to gain insight into the human experience of shock, scientists have long traumatized mice and studied their “microcirculatory shock profile.” Put aside for now the question of the experiment’s utility, and consider something even more problematic: scientists simply assumed that all mice yet to be traumatized by the scientists were starting from the same emotional/physiological baseline. In essence, that they were all passive objects awaiting human action within the framework of an experiment designed to induce trauma. In point of fact, as Rollin himself, a philosopher no less, had to remind members of the Shock Society (yes, there’s a Shock Society), the mere act of picking up a mouse and shifting it a few feet into position initiates a shock response. Scientists who might have been rearranging animal subjects for clinical traumatization would have been unwittingly already traumatizing their subjects, thereby screwing up the results and rendering the entire experiment, not to mention the harsh treatment of the rodents, totally pointless. Hence we come to what may very well be the inherent problem of animal experimentation: because we can never predict how an inarticulate animal capable of experiencing fear or pain or distress will react to the almost incalculable and endlessly subtle stimuli of any scientific environment, we can never fully trust the experimental results. As this next example illustrates, the assumption of animal objectivity, and the concomitant failure to consider the extraordinary emotional responsiveness of animals, can be hideously callous. Scientists have long wanted to understand the nature of deer mule starvation. Again, let’s ignore the utility question and get to the execution of the experiment (and, I guess, the mule deer). In an infamous experiment, the researcher simply placed a mule deer in a cage and withheld food, taking chemical readings of its rumen until it died. Remarkably, the scientist’s control group–mule deer that were fed–were housed in a cage adjacent to the starving deer, affording the tormented creature olfactory and visual exposure to the food it was being denied. Putting aside the obvious stupidity of the experiment, the stomach secretions emitted by the starving deer were completely driven by the control group, thus rendering the results useless. And all because the researcher failed to understand a basic principle of animal ethology. This sobering scientific reality, at the least, demands that we take a much closer look at how and why–and to what effect– we use animals to serve the interests of science. My sense is that, the closer we look at non-human animals, and the more we learn about them, the harder it will be to understand their behavior and, in turn, justify our own. I completely agree that animal testing should be further explored/understood and limited to real human need. The key thing to remember, however, is that animal testing is federally mandated as part of the process of drug development - so much of it would go unchecked without further regulation/change of requirements. Without a legitimate model that works in place of animals for initial drug testing, I doubt that would ever fly. So, the effort should not be put toward making a moral argument, but put towards research towards an alternative. FDA-mandated animal testing is about safety, not efficacy or basic knowledge, which he doesn't even address. The ideal result is that, after you fed half the subjects a large amount of your test substance, all of them lived happily ever after. Every single drug the FDA has approved has been tested in at least two species (usually one rodent and one non-rodent). The basic question we're asking in these studies is whether the substances are unexpectedly poisonous. The reason we ask this question in this way is because any fool can write a computer program that says "Of course this molecule that we've spent 300 million dollars on is perfectly safe. Go right ahead." Personally, I appreciate knowing this before we put these potential poisons into even one human. In practice, if you don't want to support animal testing, you either need to stop taking drugs or volunteer to be a first-in-animal test subject. It seems that you suggested that "Perhaps one way to come to terms with this conundrum is to consider animal experimentation in more abstract terms, rather than on a case-by-case basis (with many of those “cases” being purely hypothetical)," but haven't you, in fact, done completely the opposite in this piece? Does presenting to cherry-picked examples of arguably questionable animal research really help further this debate in a constructive way? I suggest you go into your local university and take a look around to see exactly what type of animal testing occurs and how essential it is for day-to-day science, and the ethical constraints that modern day scientists have to go through. Most of the points in your article highlight your extreme ignorance in biology, and the scientific method in general. I suspect your opinions on animal testing are based on a few fringe experiments conducted either before ethical guidelines and rules were established, or outside them somehow. Finally your last sentence is paradoxical; it physically cannot be harder to understand something once we learn more about it. Please stick to economics in an economics blog. This article demonstrates a fairly common misunderstanding held by those outside the scientific community in regard to the utility of animal experimentation and the treatment of those animals. Sure, animals are occasionally mistreated and sometimes the experiments are difficult to stomach. All the same, knee-jerk reactions and arm-chair speculation by someone without direct experience with such trials is dubious at best. To out-of-hand dismiss any knowledge gained from such experiments as useless without being well acquainted with the goals and outcomes is downright foolish. Most of the scientists I know who work with animals in their experiments treat them with a great deal of respect and gratitude (even verbally thanking each and every mouse). Though unfortunate, there are often (very often) no better ways to test complex physiological hypotheses than on a complex live subject. And regardless of whether the knowledge gained has direct, human implications, it is valuable nonetheless. There are no failures in science, only learning experiences. This post has no business appearing on this blog. Can you tell me what this has to do with economics, or even freakonomics? As someone with considerably lower empathy levels for non human animals than humans I am probably bias in my comments but there are many counter-conclusions I believe can also be reached at following the same train of thought as James here posed. For starters I would argue that no scientific experiment is ever done fully knowing, even half knowing all of the possible parameters (the lack of a unified theory to explain even the most basic concepts pretty much sums this up) and asking that scientists aim to know more before they experiment as a means to validate their results is a fallacy. We work in best guesses and hypothesis and few good scientists make claims in absolute terms ever, even when their results lead to things that work. However, repeated experience has shown that our best guess and hypothesis method works. We have conquered air and water, day and night, even space with such guesses. Most of this at the expense of some animals I might add. As a second point I would like to bring up the fact that as was pointed out, humans and animals do not share enough of a biological base to make good test subjects. Likewise, however, does this introduce a counter-argument: Humans and non-human animals differ at such a basic level that if we assume that experiments on them are inherently flawed from our inability to understand both our own and their emotional/physiological responses then it would be yet an other fallacy to assume that the same things that traumatize/scare/harm us mentally or emotionaly would have the same effect on non human animals, as a matter of fact it would be equally wrong to even state that despite achknowleding that difference we can somehow understand non-human animal emotional/physiological responses. For all we know all mule deers are masochists and somehow enjoy starvation. I hope that last comment brought attention to what should be the conclusion to take away here, that assuming too much, whether it is about what non-human animals may or may not feel will lead us deeper into ignorance. And furthering ignorance is probably the most counter-evolutionary trait we have. Personally I believe we should strive for more understanding but never at the expense of other, just as valuable knowledge. Truly understanding a non human animal's emotional/physiological aptitudes should be seen with as much scientific rigor as is put in understanding the diseases/conditions/treatments/etc we try to understand by experimenting on animals. But assuming too much to take a stance on any controversial issue just polarizes the arguments and makes us forget our ignorance, and IMO, that is worse. I've always thought of testing on animals as something of a moral imperative: It's that or release untested drugs on the world, surely? The argument here doesn't seem to be don't test, but test effectively. I'm sure everyone agrees with that, and I think the standards are pretty rigorous - that's not to say they shouldn't be subject to checks and improvements. Slightly disappointed in Freakanomics for posting this blog, I agree with Carnet, stick to economics! I'll admit that I have a very personal stake in this debate, as I've been doing animal research for nearly a decade. I understand the moral issues people have with this, but usually those people are not fully aware of the process, care, or importance of that research. I was extremely disappointed that this post was clearly written from the perspective of someone with so little understanding of how animal research works. Despite that flaw, the logic used in the post was terrible - as stated in the last paragraph, how is studying an organism going to make it harder to understand? And if you wanted to "consider animal experimentation in more abstract terms, rather than on a case-by-case basis," then why did you specifically pick two cases to talk about? (One of which - the one about a fear response - is a common protocol and is generally preceded by extensive handling of the animals so that contact with humans doesn't, in fact, scare them). Even though I am an animal researcher, I don't mind debates on this topic. Of course we should continue to consider the efficacy of animal use, and scientists are always searching for alternatives to animal use and ways to design experiments to reduce animal use. But if we're going to have a debate, at least attempt to legitimately learn what you're talking about before you come out here and vilify a practice you clearly know nothing about. I agree with stopping animal testing, especially when our prison system houses a population much more deserving of the pains that it causes and that will show much more accurate result. As a scientist and someone who cares deeply about animal welfare, I found this article naive, superficial, and agenda-driven. Having working with a variety of animals, from wild primates in Africa to transgenic mice for cancer research, I have experienced first-hand the bureaucratic and ethical issues associated with using animal models. The vast majority of scientists care about their animals and aim to do no more harm than necessary. This is a deeply complicated issue that unfortunately has not been addressed clearly or objectively in this post. Had to check the calendar to be sure this wasn't April 1st. Who is driving the Freakonomics bus - and could they please swerve back onto the pavement? We have thousands of terminal patients who, out of options, are willing to serve as human test subjects for new medications in the hope of a cure, or, if nothing else, as least adding to the body of knowledge that might help future sufferers. I know this sounds quite cold, but when you realize that such a program would be at the patients' prerogative, might extend their lives, and in any case would give us much-needed information that could advance medicine, it might be the way forward. Further, unlike animals, these patient's could make their own choices, even leaving the program, if they desired. Moreover, as one poster pointed out, this would add in the psychological element that is missing in animal trials. I know that if I knew I had three months to live, I would likely be willing to try any number of experimental drugs. If one worked, it would not only change my life, but could change the lives of millions after me. But barring that, I do not find it morally repugnant to perform tests on a mouse in order to eradicate some dread disease. What I DO find morally repugnant is testing the latest lipstick or cosmetic on an animal. The survival of our species calls for sacrifices, but the vanity of our species justifies no such thing. "We have thousands of terminal patients who, out of options, are willing to serve as human test subjects for new medications in the hope of a cure, or, if nothing else, as least adding to the body of knowledge that might help future sufferers." Where did you ever hear something like that? If we're all just making stuff up, how about we start making up fantasies about how we have a cure for all cancers. I have no problem with the human race exploiting animals with the proviso that that if we claim the right to exploit animals we have to take on board some responsibility. My contempt is reserved for those who only consider the issue superficially and are against animal testing because the human race inherently loves animals. For them, if so, why does the number of unwanted pets destroyed each year outnumber those used in animal testing by a large margin? And this has .... what? to do with economics? And as is so often the case, this 'article' is horribly, horribly misinformed. The author doesn't know the first thing about the topic he's writing about except what he has maybe gotten off the Internet. Send him over to my university where there is actual animal testing going on and he'll learn he REALLY needs to either stick with economics or actually learn something for real before spouting off clueless nonsense. Why you let these people post these horribly incorrect 'articles' when it's obviously FAR outside their area of knowledge is beyond me. Stick with economics, and if you want to have other topics mentioned on this site, GET SOMEONE WHO ACTUALLY KNOWS SOMETHING ABOUT WHAT THEY'RE WRITING. Animal testing is more related to environmental ethics than economics. The economic ties are to the profits from companies manufacturing goods for human use. This is quite simply one of the worst Freakonomics blog posts I've ever read... Your arguments are not based on statistical evidence, just a few anecdotes. It makes no sense to decry a whole practice based on a few examples where the effort failed. And who's to say what's a worthwhile animal experiment??
" I’m sure that if one of my children were afflicted with a life threatening disease and experimentation on monkeys had a plausible chance of finding a cure, I’d reluctantly support that research. " This says it all for me... ok if you can't understand the point of some research, but that doesn't mean you should be selfish about it.